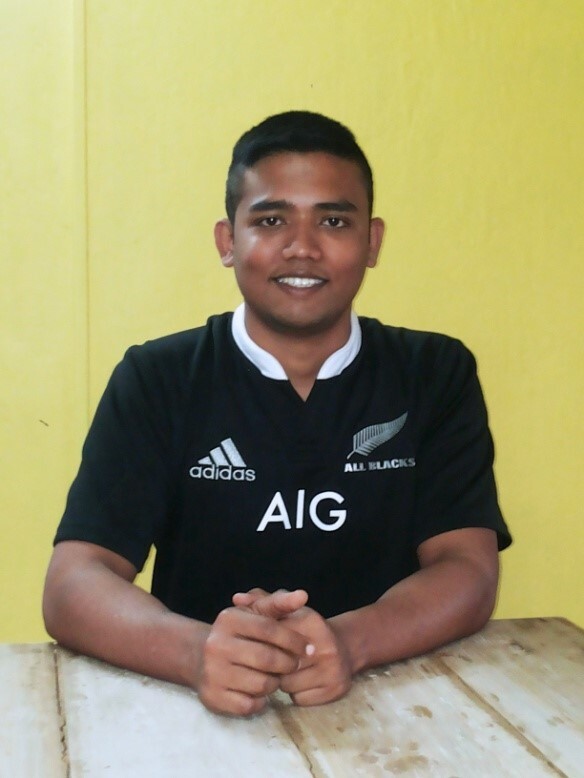 Talking Rugby Futures: as part of our series to bring out the stories of the young people impacted by the Jungle Crows Foundation today we talk to Roni about his journey and experiences. How did your tryst with rugby begin? As a child, I was very fat and would fight a lot. Other boys from Bhavani Bhavan – Tudu, Abhishek, Ritu, and Masudul were playing rugby for Jungle Crows… they called me for a game just to prove my strength. So, this is how I, my friend Pritam and other boys started playing rugby. I was 11, when Paul and Christoph were the coaches, and they would train us separately, as the other boys from Don Bosco Ashalayam knew the sport well and played better than us. On Saturday mornings, the kids have training, so Tudu and Masudul would force me to go and practice along with them. Did you experience any difficulty in playing rugby? I was very shy and wasn’t involved with much physical activities. When I joined rugby I got to meet a lot of new people from different backgrounds. Initially, I would only talk to Pritam and boys from Bhavani Bhavan. But, by playing I became friendly with others; Pankaj and Tarok from Ashalayam became my best friends. As for the difficulties, I was plump, lazy and wasn’t involved with much physical activities, so that was an issue I had to deal with. My parents weren’t supportive of me playing rugby – they believed it had no future and would do no good to me – especially after injuring my finger. They made me promise that I wouldn’t play and stopped giving me bus fair. But, Tudu and Masudul would help me, they lent out their cycles, so that I could ride to practice, they also helped me with the game. When my father had gifted me a cycle, I would lie at home saying I was going to school or going for football practices, instead I would go to the ground for rugby training. When they started getting hints, they would lock the cycle or try other tricks to not let me play. They gradually accepted it and later supported me, because at that time, Tudu had just made it big and playing at the National Level, he went to UK, and his pictures would be there in the newspapers. My parents realised that rugby could be good for me as well. And, then I got selected to play for Jungle Crows in the All-India Under 20, so then they realized that I was playing well and they could see I was working hard for it. What impact has rugby had in your life? I can’t describe the impact it has had. It’s now a major part of my life. Like I drink water and eat every day, I need rugby to live. I am working in hotels now. So, whenever I meet any guest from UK or France, I speak with them about Rugby, Calcutta Cup, and tell them that even I play rugby in Calcutta. I proudly speak about Jungle Crows and Khelo Rugby with them. When I moved to Mumbai for my work, I played for Maharashtra Police only for my passion. But, my schedule was very hectic, so I could hardly play at all. 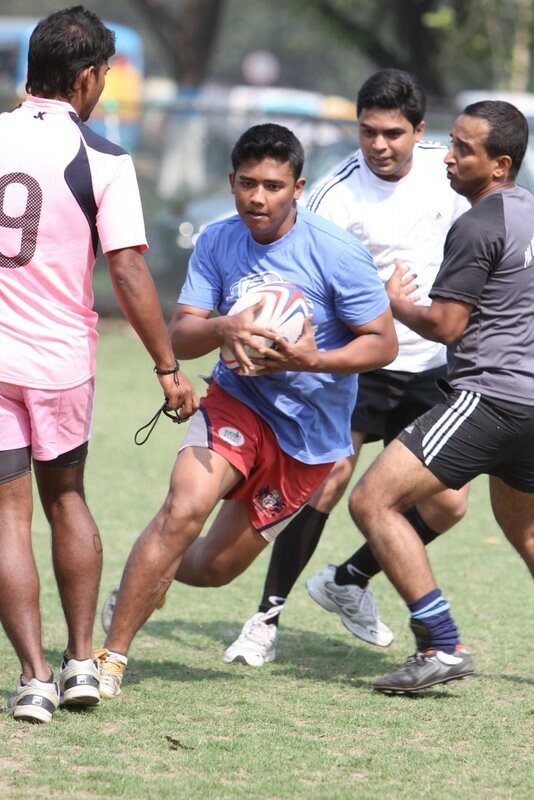 I missed playing rugby in Mumbai. When Jungle Crows lost the Calcutta cup to CCFC, I was very upset and wanted to come back to Calcutta. I was passionate about rugby and still am. If I get a chance to play rugby now, I will grab that opportunity. Rugby is in my blood – I think everyone who has played rugby will say this. We heard that you are travelling for work? It’s more like training for me, ‘cause I have not finished my 2 years training in Mumbai. I am getting a very good opportunity to work in one of the best hotels in Dubai – J. W. Marriott Marquez. First 2 years I will work as a server, first 2 years I will be a trainee captain, so they will teach me about working in a team and developing it, the difficulties you face as a team leader, how to deal with the guests and clients, etc. What inspired you to take up a career in hospitality? One day, after a game of touch rugby, Paul handed me leaflets with ‘IIHM’ written on it. I didn’t know what it stood for then. He would ask me what I would like to do after my schooling, and I would tell him about my plan to pursue an Honours degree in either English or Bengali and play rugby and think about my career later. Paul would tell me to that I might be late in making my choices about my career and handed over the leaflets to me and asked me to go through it and read more about it. As a kid I would cook a lot, and tell my mother that I will become a chef. But, the courses are very expensive and my parents wouldn’t spend that much on my education, ‘cause they how I am as a student. I did what Paul told me to and spoke to my friends about it. Everyone told me that IIHM is a reputed institution for Hotel Management. I am from a Bengali medium school, so I was under the impression that I won’t have to go to college and could do whatever I wanted to and would always hear “HM toh easy hai… sab pass kar jate hai.” (HM is easy, everyone passes in it). That time I was doing well in rugby, but unfortunately, I didn’t have a passport and I got selected for Jungle Crows senior team and, could play alongside my heroes Zaffar, Tudu, and the other boys. This was a like a dream for me, and I guess, also for many other boys who have been a part of Maidan Hazards. I then thought that I could concentrate on playing for Jungle Crows as well as on my studies and got back to Paul, and told him that my father won’t spend that kind of money. So, he told me that the money aspect would be managed, and my father would just have to pay a small sum. Funnily, when I went to apply in the college, the receptionist asked me to pay the money and I was clueless as to what money she was talking about. Then I told her to speak to Paul and Shaun (Chef Shaun Kenworthy) but, they were busy, so I messaged Paul. I was asked to wait outside until things were sorted, which was annoying. Paul came and gave me money to apply, and after he came, everyone was treating me like a celebrity. How has your relationship with Paul Walsh been like? Paul is like a father to me, and even the senior boys – Tudu, Ritu, Masudul, and all treat him like their father. Tudu would always tell me to bring something for Paul, whenever we would go outside, even if we go out to play; this would make him very happy, because he doesn’t have anyone in Kolkata and whatever he does is for us and not for his own self. He has left his work and continued to work with us. So, I really respect him for this, he’s doing so much for rugby, for us. Probably now, my relationship with Paul has become more friendly. Paul is like a father to me and, I obey him a lot. In fact, whenever he suggests something to me, I take it as an expert opinion. After my graduation I got 3 job offers- 2 in Calcutta and 1 in Mumbai. I decided to go with the one in Calcutta, for the designation and pay, as well as it would be more convenient for me. But, Paul was insistent that I should go to Mumbai, as it will boost my career. He would ask me every day about it. So, would Tudu. It was very annoying… like both never wanted me to live in Calcutta. But, I later realized that going to Mumbai was indeed a very good decision. What is your best moment in your Rugby career? 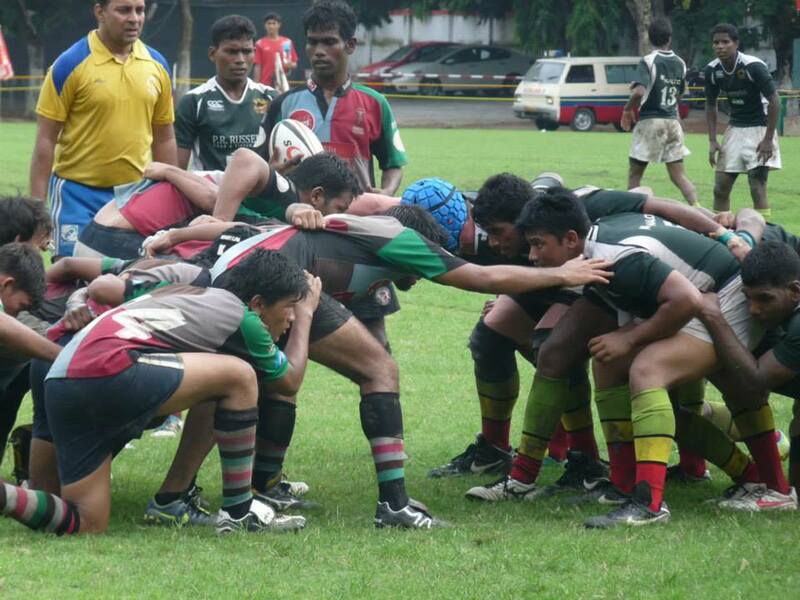 I still remember this: it was in Mumbai and we were playing for Under 20 rugby. Curtis Russell and I were playing together against Bombay Gymkhana. I scored my life’s first try, which was a good one… I had dodged few players and even tackled some in that game and, those days I used to weigh 90 kilos, so that try actually came as a surprise. Another moment, which I distinctly remember is a match against Future Hope. Tudu passed the ball to me and I could see a few players running towards me. But, then Tudu called out to me and assured that he will tackle the boys harder. That moment I realized that these boys aren’t only my team mates – they are my brothers. And, your worst or most embarrassing moment? It would be, when I was playing for Maidan Hazards, Ajay was with me… it was the last minute of the game and it was a really close match against YRC (Young Rugby Club). YRC had many strong players then – Mesu and Noa were playing for that team – they were very big, whereas we at Maidan were small and everyone’s age would be around 16-17 years old. So, at the last minute we gave 2 good tackles and were about to win, just then Ajay missed an easy tackle, allowing them to win. I felt bad on losing and I fought with Ajay over the matter, told him things which were wrong and shouldn’t be said, and as a result we wouldn’t speak with each other. What do you think about the future of Jungle Crows? How would you like to contribute for the future of Crows? I tell Paul that my travelling for work is only for a better future of Jungle Crows. By travelling I can speak with people about Crows, broaden our networks, so that we get more support. If I stay in Calcutta, no one will be benefitting. While I was in Calcutta, I was playing, learning and even earning. I was leading the boys as well. I have gained from Crows and should move up from this position. By doing so, I am giving my other brothers in the team a chance to play and make some progress. When I come back after few years, I can help Jungle Crows mentally, financially, or else all I can provide Crows with is man power. Tudu is the biggest example, he always shares his experience with the boys and whenever he comes back from UK his bags were packed with jerseys, shoes and all the essentials for others to have a safe and good game. So, like him I want to help crows. What is your advice to the young rugby players? I am going to speak only about Crows; I cannot advice some other rugby player as I’m not good at it. I have seen many boys in Crows who play for fancy shoes, jerseys, working in Crows, etc. instead of concentrating on the game and developing a career. People should think how they can get a job through rugby or Jungle Crows, which will eventually help everyone rather than settling down in Jungle Crows. for instance Masudul, he now works for the Kolkata Police, which he got through Crows. Do you think sport is a good preparation for life? Yes, it definitely is. People should play a sport. I was very lazy and plump as a child. I would opt to be a wicket keeper in Cricket, as I would have to run less. I would not enjoy running. If I hadn’t got involved with professional and competitive sport, I would have been playing video games and Gully Cricket, which wouldn’t take me far. But, after getting into rugby, and having this association with sports, I have developed a passion. After playing, I would go back home and think how I played earlier that day, areas I should focus on and how I should play in the future. Through sports, I have understood myself better and become mentally and physically fit. When I was playing very well, I never got my passport and didn’t get a chance to play for the national side. But, I’m happy my brothers – Arun and Commando got a chance to play for the national side. An achievement in rugby was when Paul named me the captain for the Under-20 All India squad. But, another achievement for me would be when I got into college, I managed to do well, although I was from a Bengali medium background and the course was designed entirely in English. And, I even landed with good opportunities to work in the one of best hotels. I’d be glad if someone walks in the same path and follows me from Crows. That would be an actual achievement. It’s time for some controversial questions. We’ve heard that you are known to make up stories. How true is this? Yes, that’s true. I love to cook up my own stories. And, to top it, I’m very talkative, so you can imagine the combination. Many people have told me this that I exaggerate to an unrealistic extent. Even, at home I hear this! If you could give a nasty tackle to anybody from Jungle Crows, who would it be? I have already given one to Tiger; it was so bad that he couldn’t remember a thing. And, if I have to give a tackle now, it will be Tudu, because he is the one who has taught a lot of things in life, especially rugby, and he’ll be happy to see me excelling as a player.